This property is directly associated with a crucial period (1950-1966) during which downtown commercial redevelopment began to occur after nearly thirty years of stagnation as several major modern municipal government and commercial buildings were constructed. However, compared with massive post-war suburban real estate development, relatively few new buildings were constructed in downtown Seattle until the late 1950s. Major modern construction included the Public Safety Building (1951, destroyed), Seattle Public Library (1956-59, destroyed) and the Municipal Building (1959-61, destroyed), as well as the expansions of the two major downtown department stores. Scattered major commercial construction included several notable extant buildings that reflect modern zoning changes and architectural trends including: the Norton Building (1958); the Logan Building (1959); the Washington Building (1960) and the IBM Building (1961-64). The Seattle World’s Fair - Century 21 Exposition was held in 1962 and triggered the remodeling of older buildings and the construction of the monorail, and tourist-oriented restaurants and motels. Throughout this era older buildings were demolished to make way for surface parking lots and garages and for interstate freeway construction. This bank building is located in the financial district that evolved along Second Avenue in the early twentieth century in tandem with the major retail enterprises as the commercial district expanded northward. During the post-fire era and the earliest years of the twentieth century, the headquarters of the major banking enterprises were clustered near First Avenue and Yesler Way or along the southern end of Second Avenue near Yesler Way. However, by 1912 nearly all of the major banks and financial institutions were headquartered at locations along Second Avenue near Marion and Madison Streets. 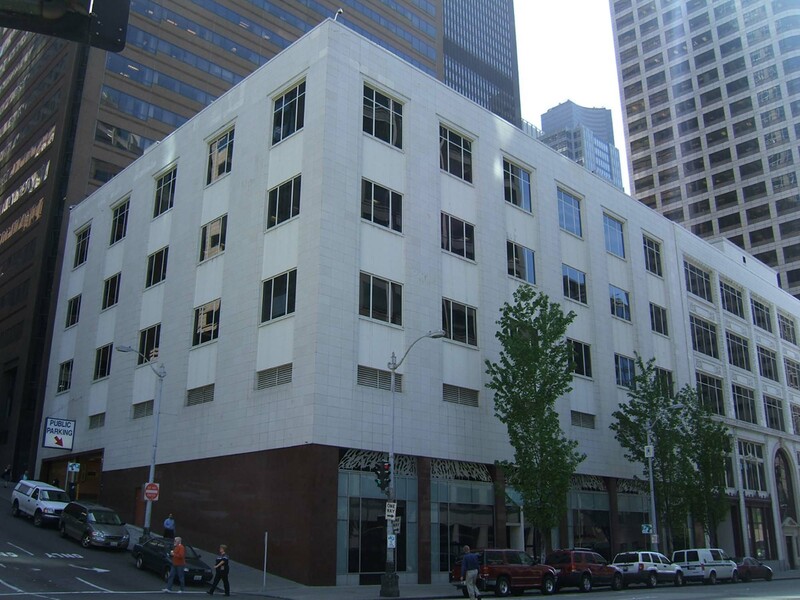 By the mid-1920s, the financial district was well-established at this location as banks and other financial institutions continued to construct or occupy portions of large commercial office buildings as well as smaller scale buildings devoted entirely to banking operations, including; the Scandinavian American Bank (Alaska Building, 1904); Seattle Trust and Savings Bank (1910, 1922); Seattle National Bank (1910); National Bank of Commerce (Baillargeon Building, remodeled 1918); Union Savings and Trust Co. (Hoge Building, 1911); the Dexter Horton (Seattle First National Bank) Building (1922); and the Bank of California (1923-24). The adjacent (and inner connected) Baillargeon Building was constructed in 1908 as a department store. The fate of the department store is not fully known; it appeared to have ceased operations in 1911 or 1912 after J.A. Baillargeon suffered an illness and disposed of this business. [However, a Webster & Stevens photograph dated 1916 indicates that the department store was in use and the Rathskeller was located at the basement level.] The Baillargeon Building was purchased by the National Bank of Commerce in 1918 and in 1919-20 it underwent a major interior and storefront remodeling in order to serve as the bank headquarters. In 1941, a fifth floor level was added to the building then in 1957-58, the J.A. Baillargeon Building was further remodeled and the banking operations expanded into this modern bank building by George W. Stoddard. The subject building and the Baillargeon Building were collectively known as the National Bank of Commerce Building until that banking institution was merged to create Security Pacific Bank, the name they are both now commonly known as. The subject bank building replaced two older buildings on the site including a three-story, wood-frame, gabled building that was built in 1891 that the National Bank of Commerce purchased for $137,611.02 in 1956. The second building was a three-story terra cotta clad store building that may have been incorporated into the construction and design of the modern building. This modern building bank was designed in the striped/starved Classical design mode (and included an indoor parking level) by George Wellington Stoddard. The firm of Stoddard & Son was composed of Lewis M. Stoddard and his son, George Wellington Stoddard (1896-1967); they practiced in partnership from 1918 until the death of the elder Stoddard in 1929. The firm is known for having designed the Winthrop Hotel in Tacoma (1926-27), the Second Avenue Garage (1926) and Central Tire Company garage building (600 Olive Way, 1925). After his fathers death, George W Stoddard practiced on his own and in partnership with others (Francis Huggard as Stoddard, Huggard & Associates) and is particularly well known for distinctive residential design work from Colonial Revival designs, depression-era small homes to large post-war era minimal tradition and ranch style residences. He was also responsible for the design of Memorial Stadium (1947) now part of the Seattle Center, the south stands at the University of Washington Stadium (1950), and the Green Lake Aqua Theater (1950). This building is a partly altered example of an important downtown banking institution property type. It is a notable example of post-war modern architectural design and one of only seven extant downtown buildings dating from this era. It was designed a skilled local architect, George Wellington Stoddard, in a successful effort to unify it with the design of the adjacent historic department store/bank building. Together, with the Baillaergeon Building, the buildings represent an illustrative whole indicative of the historic evilution of this banking and retail corridor. The National Bank of Commerce/Security Pacific Building is located at the sloping SE corner of Second Avenue and Seneca Street and has been functionally interconnected to the adjacent Baillaergeon Building since it was constructed in 1957-58. [The Baillaergeon Building is identified/discussed according to a separate Inventory Form.] This five-story building was originally designed and constructed as an addition to the Baillargeon Building, creating a large banking and office complex with internal parking at the 2nd floor level. The roofline, floor plates and fenestration were designed to be in character and alignment with the older building. It continues to be used as designed for commercial office purposes. The building measures 120’ x 108’ and includes a concrete foundation and basement. It exhibits a two-part vertical block façade composition and is designed in a minimal modern architectural design mode. The concrete and steel structure is clad with square ceramic terra cotta panels (cream-color) at the shaft and red-black polished granite at the base. Both the Second Avenue and Seneca Street elevations are distinguished by three-story window bays extending vertically from the second floor level. Each bay is deeply inset with flush windows and spandrels at each floor level. The window bays are enframed by the smooth flush terra cotta clad walls that extend from the top of the marble base to the simple unadorned building cap. The window spandrels appear to be a vertically grooved metal product and have been painted to match the cladding, which diminishes the vertical design character of the bays. The narrow window opening at the bottom of each bay houses ventilation panels serving the parking level of the building. The first floor level is clad with marble and divided at Second Avenue into six bays that correspond with those of the shaft. The original glazed storefront window and transom areas have been entirely reconstructed using modern materials including white granite bulkheads and sculptural metal elements. There are no retail openings and the building entry is in the northernmost bay of the adjacent building. The garage entry is in the easternmost bay of the north elevation. The original multi-pane upper floor level windows were industrial type steel sash and matched sash that was also installed at the adjacent Baillaergeon Building. All of the original upper floor level windows have been removed and replaced with a modern aluminum product. There do not appear to be any remaining intact or architecturally significant interior building features, finishes or public spaces.